Deprecated. Moved to the org.geotools.gui.swing.referencing package. A pane of controls designed to allow a user to select spatio-temporal coordinates. 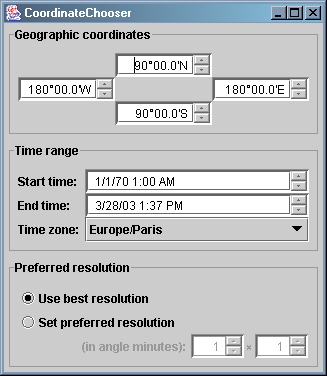 Current implementation uses geographic coordinates (longitudes/latitudes) and dates according some locale calendar. Future version may allow the use of user-specified coordinate system. Latitudes are constrained in the range 90?S to 90?N inclusive. Longitudes are constrained in the range 180?W to 180?E inclusive. By default, dates are constrained in the range January 1st, 1970 up to the date at the time the widget was created. Deprecated. Constructs a default coordinate chooser. Deprecated. Constructs a coordinate chooser with date constrained in the specified range. Constructs a default coordinate chooser. Date will be constrained in the range from January 1st, 1970 00:00 UTC up to the current time. Constructs a coordinate chooser with date constrained in the specified range. Note that the range is not the same than the range given to CoordinateChooser.setTimeRange(java.util.Date, java.util.Date). The later set only the time range shown in the widget, while this constructor set also the minimum and maximum dates allowed. minTime - The minimal date allowed. maxTime - the maximal date allowed.